SCW gets jazzy. Horns would become a bigger part of SCW’s sound in subsequent incarnations, first as a free jazz ensemble and then as a disco-funk band. 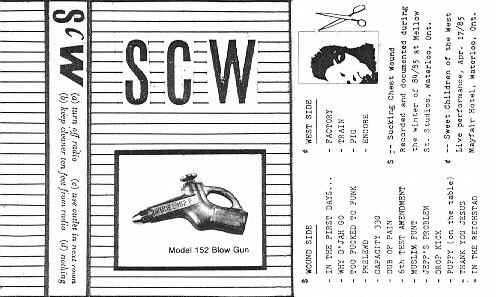 The second side of the Model 152 Blow Gun cassette is a live recording from April 17, 1985. See the previous post for some video footage of the show. This entry was posted in Audio, History, Video by suckingchestwound. Bookmark the permalink.